1690 # / 169 sq ft = 10.0 #/sq ft = typical wing loading on our local flights here at Williams with two pilots aboard. If the pilots are lighter or heavier, than a total of 388# you can calculate the wing loading for yourself. but on average, it’ll be about 10 # per sq ft. Recommended towing speeds are based upon actual wing loading. Thus, the recommend tow speed is 65 to 70 kts for our tow speed. You should realize that if you are towing at 65 kts and it feels like you are nose high, you may have the flaps in Flaps 2. By selecting Flaps 3 or even Flaps 4 you will see the nose comes down considerably and you may find this a more comfortable tow position. Keep n mind that Flaps 5 and 6 are prohibited while on tow. insert reference for this?? Chart in the manual (paragraph ?) provides stall speeds at each available flap setting, for a weight of 1,653 #. It is significant that the stall speeds do not cover a very broad range ( 37 to 44 kts). Flaps 3 when 57 kts to 72 kts. not always in level flight, maybe remain in Flaps 3 up to over 75 or even 80 kts on occasion. Pink line represents a weight of 1690 Lbs. 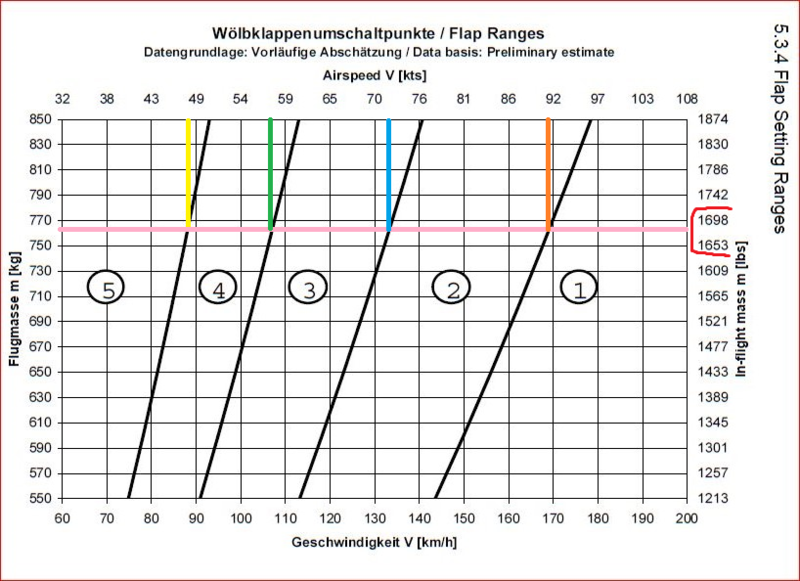 For example, on the speed ranges – the orange vertical line indicates you should switch to flaps 1 when accelerating to a higher speed. When accelerating away from a climb, as you pass through about 57 kts (Green line), move flaps from Flaps 4 to Flaps 3. If you decide to fly above 72 kts (Blue line), then select Flaps 2. The center of gravity dictates the amount of downward force that will be exerted by the tail. We always have a positive C of G, thus it is always ???? but we want to minimize ???? CG with a single 175 # pilot has been calculated to be 12.61 inches.